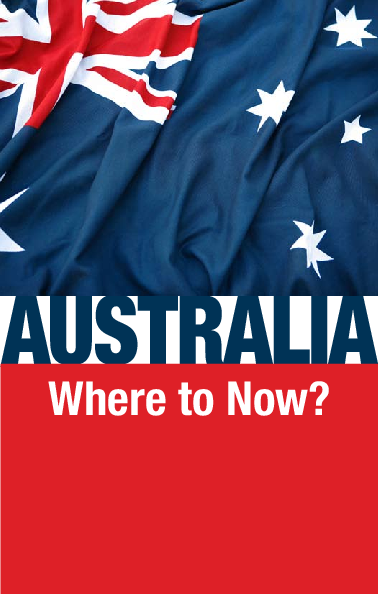 The shift to the left in Australian politics in 2007 was counter that of much of the rest of Western society, in particular a rising Europe. Even Britain, caught for a decade in a socialist warp, is showing signs that it is tiring of the societal and economic confusion that a decade of center-left politics has produced. With the consummation of the Reagan-Thatcher years that saw an end to Soviet dominance in left-wing ideology, socialists stood aghast at the massive collapse of the whole Soviet political economy constructed as it was on the sand of godless, anti-capitalist communism. The icon to the Marxist-Leninist ideology they had embraced and foisted off to wide-eyed students at their colleges and universities had been measured and found to be greatly wanting. The result was an ideological vacuum within leftist politics in Western society. By the mid-1990s, the “third way” theory began to fill that void, in particular breathing fresh life into parties on the left of the political divide. Thus was born the center-left movement. At the time, the Philadelphia Trumpet pointed to the fact that the third way was little more than rank fascism dressed in new clothes. Committed socialists found it an easy transition from their Marxist-Leninist foundations to embracing this third way alternative. World leaders during this period—in particular U.S. President Bill Clinton, British Prime Minister Tony Blair, German President Gerhard Schröder, and his foreign minister, Joschka Fischer—were all proponents of the third way. During the most fashionable period of the third way influence on government policy in the United States, Britain and Germany, government policies concentrated, in the main, on soft issues. The center-left parties even crossed over the capitalist line to appeal to middle-class voters as responsible managers of post-Cold War era economies and as social reformers. Labor market restructuring, huge expenditure on education, a soft line on immigration—all of these issues gained the center-left much support through the latter half of the final decade of the 20th century and on into the early years of the first decade of the 21st century. Yet, much like its failed socialist mentors, communism and fascism, the third way is now being seen by many of its middle-class followers as having failed to deliver on its promises. Hence the drift from the left to the right as witnessed by election results and opinion polls in Europe. This drift to the right of center is also apparent in opinion polls within Britain. Within Australia things appear to be different. Australia voted for a change from a decade of conservatism, electing a center-left government in November 2007. Step aside from the brouhaha surrounding the economy, and at center of the political argument in Australia is the key issue of values. This was nowhere more apparent than during the confusing discourse that emanated during the Rudd government’s infamous Australia 2020 Summit of April 2007. Almost 50 years of the feminization of Australian society has pushed a false idea on gender to the point that the male is emasculated, the female masculanized. Meanwhile, a whole subculture of androgynous weirdos have wormed their way into positions of influence to continue the work of perverting the very foundation of nationhood—monogamous marriage and the home-based family. In addition to the impact of social change instigated by the feminist, politically correct and homosexual lobbies, the multicultural movement is trying to impose on Australia a mixed-race overlay that risks the nation losing a hold on the bedrock culture that once made it one of the most appealing of countries to live in. The key to just how a new government will handle the affairs of a nation is often set by the tone of its first few months in office. Australia’s new socialist, third way (center-left for the pedantic) government produced a document following its initial three months in office called “First 100 Days—Achievements of the Rudd Government.” One commentator, aware of the new prime minister’s love affair with China, called the document the “little beige book,” a play on Chairman Mao’s infamous “little red book,” often seen in the hip pocket of university students in the 1960s and ’70s who have since become embedded as part of the center-left establishment in Australia (Australian, Feb. 29, 2008). Apart from fighting inflation, these are all center-left, soft issues. Even so, while fighting inflation would be a fundamental platform of any government leading Australia today, it will be interesting to note if this masks any effort to restructure Australia’s economy to reflect what third wayers in Europe sought in implementing what one observer declared was a failed “combination of moderate neoliberal economic and fiscal policies along with an insistence on the continuing role of the state, including the welfare state, and a liberal-progressive standpoint on cultural issues …” (Prospect, March 28, 2008). So there was really nothing new in this assemblage of issues proposed by Australia’s newly elected government in early 2008. What is most interesting is that they were emphasized as the “first steps” that government envisaged as it took over the reins of power. But to the electorate in Europe, these are old steps that clearly have not worked. Australia should have looked more closely at the results of center-left politics in Europe, where their failure has caused a clear drift to the right in the electorate. For example, concerning the center-left approach to running economies, “the promise of the reformers … has lost credibility. … Youth unemployment in Europe stands at 18.7 percent. [S]econdary school graduation rates in the EU have barely changed in 20 years. … Most of the center-left parties seem clueless in the face of the decline of their technocratic project. … The project must free itself of the economism of the third way …” (ibid.). Yet apart from these demonstrated failures of center-left politics in Europe, there are two overwhelming negative impacts that have resulted from the efforts of these third wayers to reconstruct society to their version of the utopianist dream: the impact of immigration and of socialism on the fundamental virtues that are the very foundation of a stable society. Political scientist Ernst Hillebrand describes the impact of center-left policies on society in cutting terms. Concerning the impact of increased immigration on the societies of European countries, Hillebrand commented, “Multiculturalism … has failed. It has led to fragmented societies and ghettos of marginalized minorities in which the mutual frustrations of indigenous populations and immigrants have increased” (ibid.). This, perhaps more than any other failure of the center-left, is leading to the increasing swing back to conservatism in Europe. As Hillebrand observed, “There are signs that in Western societies, a creeping change of values is taking place which the center-left parties seem not to understand. … Opinion polls indicate a slow shift in the direction of traditional values” (ibid.). The light has dawned in Europe. The center-leftists—the third wayers—are on the back foot on the Continent because of the failed policies borne of this ideology. Is Australia’s government, like its left-of-center cohorts in Europe, proving itself “clueless” in the face of the task the Australian electorate has given it? In fact, how “clueless” was the electorate for voting in a government based on what is now, so obviously, an outmoded and failed political ideology, that of the center-left? At a time when Australia needs to show some backbone, rather than kowtowing to China in order to keep in its good books to retain its custom for its mineral wealth, it is showing the reverse. At a time when Australia needs to place its ethnic minorities in perspective as just that—minorities—subject to the laws, the cultural practices and traditions of its Caucasian majority population, it has elected a government with soft policies on multiculturalism. At a time when the strength of the Asian flood to Australia’s north is rapidly rising, Australia ought to be strengthening its alliances with its fellow Anglo-Saxon nations, rather than withdrawing troop support from the war on terror. This is just sound, basic common sense. Yet common sense was never high in the order of “values” propounded by liberal socialists, otherwise Western society would not be in such a mess today. The greatest need, not only in Australia, not only in the Western world, but around the entire globe, is for a form of government that is rooted and grounded in a system of common laws, statutes and judgments that guarantee to produce the virtues of a true, peaceful, unified civilization. Believe it or not, such a government already exists! It just has not been implemented globally … yet! But it will be, as sure as the sun will rise tomorrow. Read Isaiah 9:6-7 for a view of the future of this globe that is both stunning and breathtaking in its scope and impact. The contrast between that government and the governments of today is as that between day and night. Even a hard-bitten Aussie, provided one has an open mind, should not fail to be moved by the promise of that vision! It’s summed up in this short passage within the book upon which the true foundational values of Australia were built. Continue Reading: Chapter 4: Sorry for What?